Picture not exactly as shown. So what's the main differences between PREM Premiere / Essentielle & Classic/PURE? If you require left hand hinge, please specify when ordering. 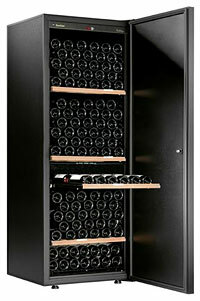 EuroCave wine cabinets offer 1,2,3 and Multi-Temperature cabinets. Available in a variety of sizes and shelving configurations. Extreme climate conditions? 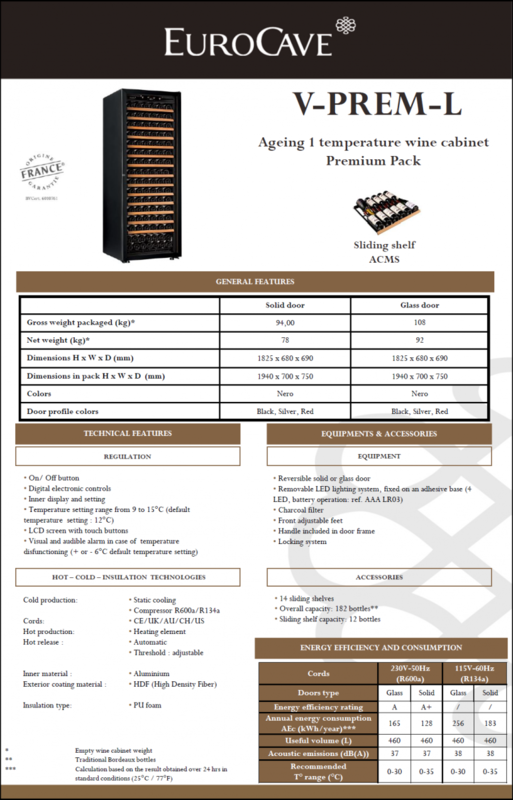 Many of the EuroCave cabinets are able to withstand temperatures from 0 to 35° Celsius. Operating since 1976, EuroCave has earned its international renown for quality wine preservation systems. All of our EuroCave cabinets are available with Glass or Solid Door and in any of the colors offered by Eurocave. Rosehill wants to ensure our customers are educated about the entire EuroCave line-up and what is available. That is why we have listed the full range of EuroCave product on our website. The Origine, Premiere - Essentielle, La Petite and NeoFresh Series should be readily available. The Classic and Compact may be a special order item depending on your selection. Please contact for availability. The Origine, Premiere - Essentielle, La Petite, NeoFresh & Classic Series are Free-Standing. The Compact/Built-in series can be built-in. 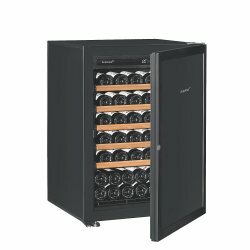 EuroCave products are designed specifically for wine storage - they are not adaptations of a more general storage or refrigeration product. Every EuroCave product category (wine cabinet, storage system or cellar conditioner) is the culmination of detailed and lengthy research. This catalogue provides a selection guide and information on the strong points and weak points of the main technologies on the market and tables of the technical specifications for each product presented. This allows you to make your choice with the benefit of all appropriate information. The EuroCave international service desk is available to all EuroCave distributors on more than 70 countries. This allows local factory trained engineers to access on-line technical support run by manufacturer's professional staff to enable the diagnosis of a problem and the provision of a solution. Manufacturer's original spare parts can be promptly dispatched to your distributor to enable even the most complex problem can be quickly and efficiently solved. This service is the assurance that irrespective of what country your EuroCave product is installed in, you will have rapid and efficient after sales service. Standard Cold circuit seal test on 100% of wine cabinets. Electrical safety test on 100% of wine cabinets. Final control bearing on 40 check points and operational test on 100% of cabinets enabling validation of the dispatched cabinet's conformity to the order. EuroCave subscribes to the objectives of Sustainable Development. For example, the EuroCave cabinets and air conditioners use a CFC free cooling liquid that respects the ozone layer. The wood used to manufacture the racks comes from plantations approved by the SGS Audit Program. EuroCave Wine Cabinets are made in France, with first point of entry to Canada through Laval, Quebec, H7T 2H6, CAN. EuroCave has restricted trading zones. The largest dealer of EuroCave in the United States of America, operates out of Mt Kisco, New York, NY 10549 – just outside of Manhattan, New York, New York, USA. EuroCave has specific trading areas within the US. We may not be able to sell a EuroCave into your area. US shipping cost is fixed for all of continental US. Extra charges may apply for Hawaii and Alaska. Restricted trading zones apply. We mights not be able to sell to your area. How to Choose Your Wine Cabinet.